TORPOINT FERRY REFIT - Tamar II, one of the three Torpoint ferries, will be temporarily taken out of service at the beginning of April for it's five yearly refit at the dry dock facilities at A&P Falmouth. 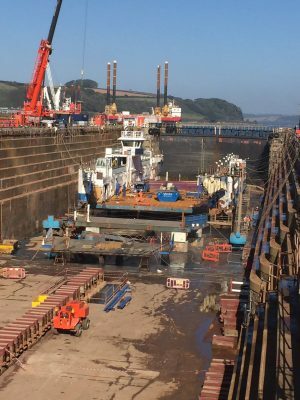 A comprehensive review carried out at the end of last year when the refit for Plym II overran concluded that the volume of work identified in the specification requires more time to complete than had previously been scheduled. Consequently, a longer ‘time in dock’ period, as well as a contingency for potential bad weather, has been agreed with A&P Falmouth. As a result Tamar II will go out of service on 1 April to enable the chains to be removed and the ferry prepared for towing. The new timelines for the refit, including the additional contingency period for poor weather, mean that the scheduled date for the ferry’s return to service at Torpoint will be 1 June. If, however, weather conditions are good and there are no other issues, the ferry could return to service earlier than this date. The Torpoint Ferry is the world’s biggest and busiest chain ferry service and the UK’s busiest inland waterway ferry crossing – providing crossings for up to 8,000 vehicles and 1,500 pedestrians each day. Tamar Crossings operate the ferries 24 hours a day, 365 days a year, in all weathers. Achieving this requires a significant planned maintenance programme. While the majority of maintenance is carried out while the vessels are afloat or during off peak periods while an individual vessel is not on scheduled service, some maintenance activities have to be carried out during refits in dry dock conditions. •	repainting the vessels both above and below the waterline – this will include using more environmentally friendly paint systems than were available in the past, and gives the opportunity to rationalise the range of paints, which significantly reduces the levels of potential waste. “We recognise that the reduction in service during refit periods is not desirable, however these refits are essential to maximise the life of the ferries and ensure that we continue to provide a safe and reliable service into the future.” said David List. The Tamar Bridge and Torpoint Ferry are jointly owned by Plymouth City Council and Cornwall Council, with the operation of the service overseen by a governing Committee comprising Councillors from both local authorities. The crossings are operated together as a single business which does not receive any financial subsidy from either of the two councils or from Central Government. This means that, unlike crossings in other parts of the country, the service is entirely self-financed through the tolls charged which pay for the operation, maintenance and improvement of both crossings.